In less than six months, Nate Wessel has helped bring change to Cincinnati’s transit system. After debuting his bus-riding basics map on UrbanCincy earlier this year, Wessel launched the project on crowdfunding site Kickstarter in April. People from Cincinnati and around the world responded to the design, and in 30 days the initiative had raised twice its initial goal of $1,000. In five days, the Transit Guide raised over $1,200. By the deadline, over one hundred donors had given $2,105 to help print and distribute the pocket guide to bus riders all over Cincinnati. Wessel also had an opportunity to interface with donors and solicit feedback on the map’s design during the fundraising period, and the updated version is better than ever. 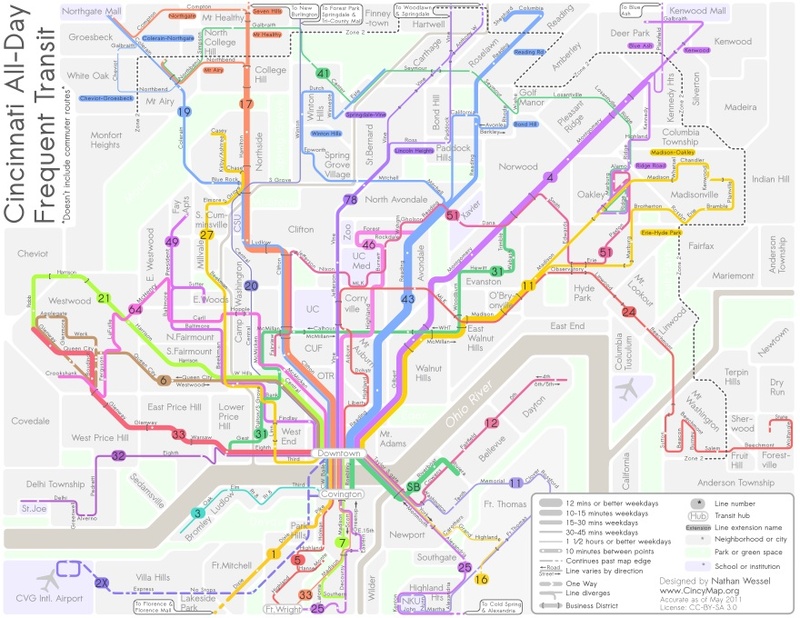 Described as a diagrammatic illustration of the Greater Cincinnati area’s transit system, the guide shows conceptually where, when, and how one can travel by bus. It’s nearer to New York City’s Subway Map or that of London’s Tube in design than to the more literal and more difficult to read maps of most Midwestern cities like Akron or Cincinnati. Like the New York map, his new map for Cincinnati highlights the important frequent and convenient transit lines over services that are infrequent, specialized or too complex to readily apprehend. Lines are spaced for easier reading, and line thickness indicates how long one can expect to wait for the next bus. The most frequent lines have buses that come every ten minutes in each direction for most of the day. The thinnest lines have service every 1 hour or slightly better. The map does not include routes that only run during rush hours to serve commuters, since these have a relatively limited application. The back of the map will answer some common questions for people who have never been on the bus before, point out peculiarities of specific lines and highlight major routes and bus stops in Downtown. The funds from the project will be used to print and distribute more than 30,000 pocket-sized copies of the map and several hundred posters to organizations and businesses in the area. He believes many in the city would utilize the bus service if they understood it better – where and when the buses go. The local transit authorities have tried, but not completely succeeded in making their maps user-friendly. Nate will be giving a talk at the Contemporary Arts Center on May 23rd to further explain the project. Updated Cincinnati Transit Guide map provided for UrbanCincy by Nate Wessel.